In celebration of LeRoy Grannis’ legacy and his great contributions to both the surfing and art communities, M+B is pleased to present a commemorative exhibition of LeRoy Grannis’ photographs to honor his legendary career. Documenting the Golden Age of Surfing—the Sixties and Seventies—Grannis was the first to capture the purity, soul and lifestyle of a seminal moment in American cultural history. Dubbed the “godfather of surf photography” by The New York Times, Grannis supplanted himself as THE photographer that documented the birth of a generation spurred on by both the surf-film Gidget and the Beach Boys who created an entirely new youth subculture centered around the surfing lifestyle. Whether shooting surf-god (and surfing buddy) Greg Noll catching the big waves in Waimea Bay or a San Onofre parking lot filled with long boards, VW buses and surfer girls, Grannis’ work nostalgically embraces both the lost elegance of the sport as well as the idealization of this uniquely California lifestyle. Grannis’ poignant images record the decades’ surfing spirit and evoke a sense of timeless grace that greatly contrasts with the modern-day extreme sport and endorsement-filled notion of surfing. Grannis’ awards for his accomplishments are far-reaching. In 1966, he was voted into the International Surfing Hall of Fame as the number one lensman and later in that decade Life Magazine presented him with “First Prize for Action Sports Photograph.” In 1993, Grannis was honored with the Eddie Aikau/Quiksilver Lifetime Achievement Award; in 1999, he was inducted into the Huntington Beach Surfing Walk of Fame; in 2002, he was awarded the “Lifetime Achievement Award” for his legendary surf photography by the Surf Industry Manufacturers Association; and in 1998, The Surfers’ Journal would honor Grannis with his first monograph Photo: Grannis, which was also first book The Journal would publish. 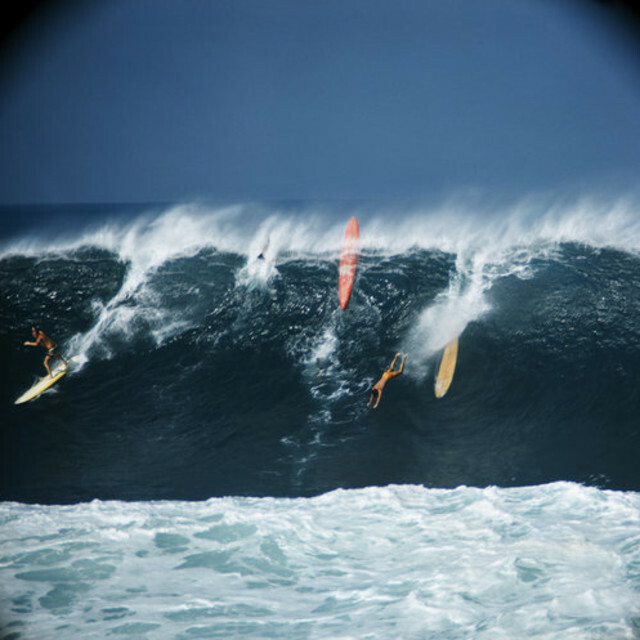 His work reached a broader audience in 2004, when Stacy Peralta featured his photographs in the critically acclaimed surf documentary Riding Giants and in 2005, when they appeared on the cover and within TASCHEN’s Surfing: Vintage Surfing Graphics. Later that year, M+B gallery in Los Angeles exhibited his photographs as fine art for the first time. Other major gallery and museum shows around the world continued. In 2006, TASCHEN published his second major monograph as a limited edition, which—due to the demand—is now in it’s second trade edition publishing. And in April 2011, the Los Angeles County Museum of Art (LACMA) acquired a LeRoy Grannis’ photograph for their permanent collection. LeRoy Grannis surfed religiously well into his 80s until a hip injury forced him off his board. On February 3, 2011, Grannis died of natural causes at his home in Torrance. He was 93. A paddle out memorial was held in Palos Verdes Cove in June, and later this month, Hermosa Beach is slated to unveil an impressive 10-foot bronze sculpture honoring Grannis’ work that will be located at the Community Center Pier and Pacific Coast Highway. This will be Grannis’ fourth exhibition at M+B.